Whether you play slow pitch or fast pitch softball, you will hit a homerun with these Softball iPhone Cases for Girls! Show off your team colors and jersey number on your softball iphone case! And these are just the tip of the bat! Find the bases loaded with Customizable Softball Phone Cases for Girls at Little Linda Pinda’s gift shop ~ Just Click Here! Softball Phone Cases for Girls! Softball Phone Cases for girls include this stunning Case-Mate, made in from Norcross, Georgia, USA, with a 4.5 star rating ~ Homerun! This iPhone 6 Case is precisely made with a 4.7 inch screen. Made with a flexible liner to absorb all the tough shocks of an athlete! Also made for perfect access to all ports, controls and sensors ~ No need to even take off your gloves! The case is made to protect your screen from contacting benches and other surfaces directly. The really cool thing about this cute eye-catching phone case is it is customizable with your name, last name, team name or monogram. What is your Jersey Number? Put your number, and even change the background color to your team color. Very Fast-Pitch! Simply click above, and then click the “Customize It” button. Easy as sliding into home plate! Batter up! Softball iPhone Cases for Girls! Same great stats as above, this tough little case sure hits a hard drive! Lightweight, this Case-Mate iPhone 6 case will fully protect your phone while you play the game! Printed in the USA and printed with your number, name and colors ~ wouldn’t that be a steal?! Here’s a great change-up ~ you can change the text and the cool “beveled glass” look of the threads to YOUR color, too! What a fastball! We will be glad to help customize all of our Softball Phone Cases for Girls at Linda’s personalized gift shop, no fouls or outs! Just call Bev at: 239-949-9090. Custom Cool Softball iPhone 5C Softball Cases! Available only for the iPhone 5C, but Bev can custom make this same design and colors on any of our Softball Phone Cases for Girls! 5C case hugs the back and sides, is lightweight, with a glossy finish and jewel-like radiance. Of course you have access to all port, controls and sensors ~ an easy no-hitter! Just click Customize It, adding your jersey number, name or team name. The Radiant Orchid, which is the color of the year, will make someone cool on the field and WOW! off the field~ and pretty happy with this gorgeous look! Multi-Colored and Multi-Cool, a Softball iPhone 6 Case! Great features for the iPhone 6, Made by Case-Mate, in the USA, and printed in the USA, featherweight, form-fitting and full coverage with a 4.7 inch screen in one sleek and unique, looking stylish all around! Access to all ports, controls and sensors ~ everything fits to a T! Customize with your personal stats, as with any of our Softball Phone Cases! 5 iPhone or 5S iPhone Case! Play Hard Get Dirty and still protect your 5/5S iPhone with this Barely There Case-Mate case. Made and printed in the USA, this tough case covers the back and corners with a flexible plastic shell that’s impact resistant. Of course, all the ports and buttons have easy access. Customize this cool Dirty Softball iPhone Case for Girls with your text, or your name/initials and jersey number, team name. Comes with Play Hard or Go Home, or change it up, keeping the Dirty look. A cool message for girls who Play the Game! Tough and Extreme Softball iPhone 6 Case for Girls Softball player! Attention! Now this is tough as a triple play! This has to be the toughest phone case! Tough Xtreme ~ pairing military-grade protection with great coverage and an extra tough style, you can bet this super durable Case-Mate case will withstand a day of practice and then some! Three layers of toughness and all the fast pitching you can give it, with a built-in 4.7 inch screen protector, this case will make it to the championship and beyond! The stats are impressive, made to withstand rain, sand, dust, and being dropped, as well as vibration from practices, warm-ups, and that championship game ~ this Softball phone Case for Girls can take it! Additional specs: There are protective coverings on all ports, controls & sensors and a textured exterior for better grip ~ great on hot days! Made and printed in the USA, as all of our Softball Phone Cases for Girls! Add your name or text, you can even change the background color. But with this Tough Girl Black and Pink and a Tough Xtreme Custom Softball iPhone 6 Case, why go soft? Curve ball! Case-Mate Girls Softball iPhone 6 Plus Case! Up to bat, another shock absorbing, impact-taking Case-Mate, made in the USA, Tough iPhone 6 Plus Case! This softball phone case for girls is for an iPhone 6 is precisely contoured for the 5.5 inch screen. Your screen will be protected from directly contacting the surface, and you can access all the ports, controls, and sensors. This is one attractive phone, calling attention to your Fastpitch game and number! 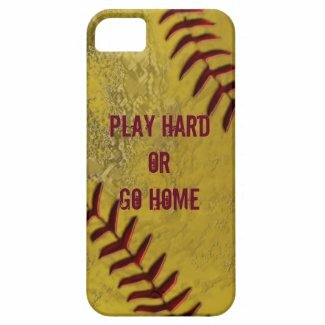 Just another one of our unique Softball Phone Cases for girls that we offer at Linda’s gift shop of customizable gifts! What a Headliner! Turquoise Swimming Pool Girls Softball iPhone 6 Phone Case! Jump in ~ the water’s perfect! One of our newest Softball Phone Cases for Girls ~ or for Moms! THE iPhone 6 case, ready to swing with you through the day! With your softball number and name or team name, you could be in the stands as a proud mom watching, or you could be on the field with this tough and durable gorgeous turquoise phone cheering you on! Easy Customize instructions, just click above! As with any of our Softball Phone Cases for girls, we can customize and personalize something really special for you or for a special gift that will surely be treasured! Just call Bev at 239-949-9090.